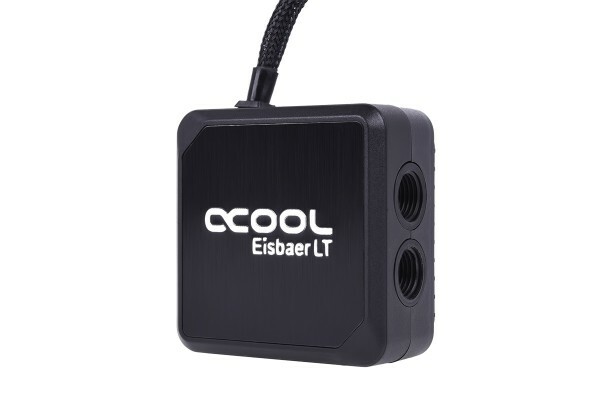 The popular Eisbaer LT AiO liquid cooler is now also available in a solo version. This gives you the opportunity to design your own AiO solution according to your wishes. All connections use the G1/4" thread which we have all become to love. This is the common format for almost all water cooling fittings. You can also decide for yourself which hoses and radiators you want to use, so nothing stands in the way of your own design ideas. The basis of the Eisbaer LT Solo is the well-known DC-LT 2600 Ultra Low Noise Ceramic Pump, which is also available separately. It was specially developed for compact systems and offers enough performance to create a loop for them. The pump is operated via a 3-pin Molex connection and can be regulated via a voltage from 7 to 12 V. This means that the already high performance of the water cooling circuit is maintained. This significantly reduces the volume of the already extremely quiet pump. The radiator is made of pure copper and has an ultra-fine cross slot structure for maximum cooling performance. To further increase the performance, the Eisbaer LT Solo also uses a nozzle technology. This accelerates the water just before it hits the CPU cooling plate, so that the heat can be transported away from the CPU more quickly. The Eisbaer LT is the perfect base to create your own CPU AiO water cooling system according to your own design. Let your ideas run wild.